This is famous Maharashtrian Chutney that you generally eat with Batata Vada. This tasty dry Chutney is easy to make and lasts for 2-3 weeks at room temperature. 1. Dry roast the grated dried coconut till it is light brown. spread it in a plate for it to cool. 3. On cooling grind the roasted grated coconut in a grinder to get coarse powder. 4. Crush garlic cloves separately into a smooth paste. 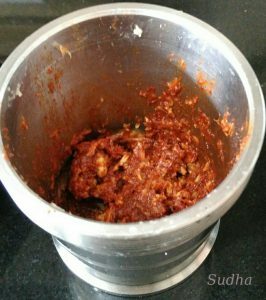 I normally use Khal – Batta / Mortar – Pestle / Khandni – Dasto for this as small quantity does not grind properly in Grinder. 7. 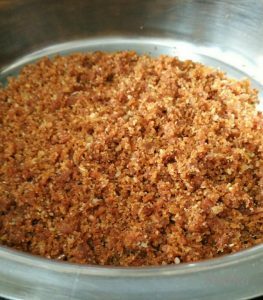 Add salt, red chili powder, jaggery and tamarind (chinch) in Khal and pound it further to make a coarse paste. 8. 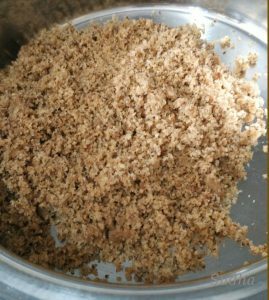 Now mix this garlic mixture with ground coconut; you can either mix it by hand or in grinder. Serve this Chutney with Batata vada, Bhajiya, Roti, Rice or actually with anything. I like it most with Rice and Curd. Note: If you use Kashmiri chilly powder – you will get vibrant red colour chutney. I didn’t have it; so used normal chilly powder. 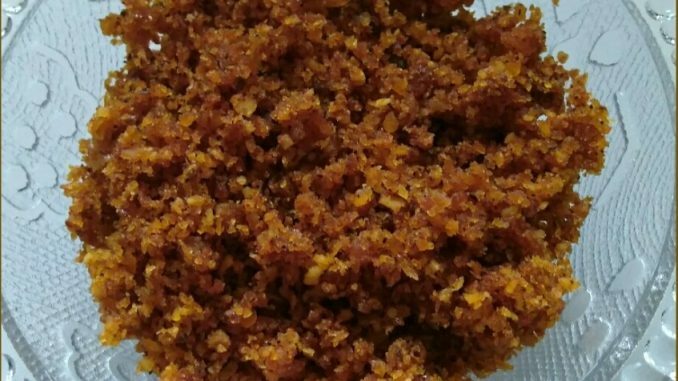 We like the taste of Jaggery and Imli (Khatta Mitha / Sweet n Sour). 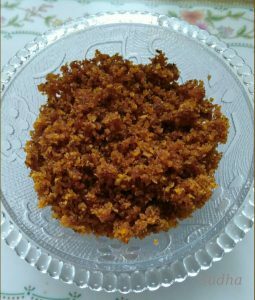 If you don’t like this taste; do not add Jaggery. This chutney lasts for 2 to 3 weeks at room temperature if stored in air-tight container.